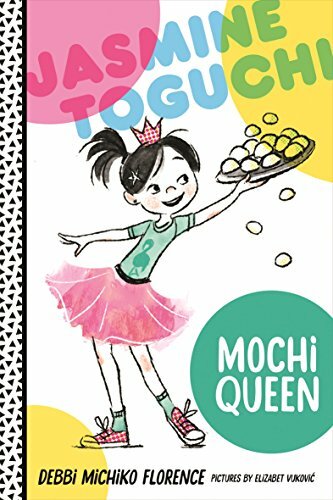 The book Jasmine Toguchi, Mochi Queen is about a girl named Jasmine Toguchi who wants to roll mochi with her older sister, Sophie. There's one problem, though; you have to be 10 to roll mochi and Jasmine is only 8. Mochi is a gooey Japanese rice dessert. Jasmine decides to pound the rice for mochi instead. But with that, there's another problem: pounding mochi is traditionally reserved for boys, and the mochi hammer is heavier than it looks. Jasmine needs to turn her spaghetti noodle arms into strong arms for mochi pounding and convince her parents to let her pound mochi. I liked the book Jasmine Toguchi, Mochi Queen because it jumps right in to the plot. This is also a bad thing because it doesn't give much description on the characters. Another reason that this book was great was because it gave lots of detail about the plot and held my attention. I would recommend this book for 6-8-year-olds because it is an easy chapter book and has simple vocabulary.